We are Manufacturers and exporters of high quality Pharma Grade Invert Sugar Syrupfrom India. OurPharma Grade Invert Sugar Syrupis widely used in various Industries including Hotels, restaurants and Coffee shops. Our Pharma Grade Invert Sugar Syrupis widely used in bakeries, soft drinks, ice creams and Distileries etc. We are exporting Pharma Grade Invert Sugar Syrupto various countries like Middle East, UAE, Israel, Dubai, Poland etc. 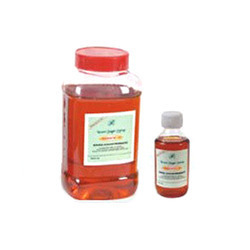 We are also engaged in meeting the manufacturing and supplying demands of Energetic-H sweetener Pharma Grade Invert Sugar Syrup to our clients. Our products are manufactured with high-quality materials and are demanded in the market for their freshness and usefulness. One can easily avail our products from the market at very reasonable rate. The products have a vast application in the pharmaceutical industry. Ideal for all liquid formulations as well as the medicinal syrup which are not palatable and therefore require sweetening - a replacement of sugar. Taste masking effect on the bitterness of medicinal syrups due to high osmotic pressure. As a source of instant energy due to the direct assimilation of glucose and fructose in blood without actually increasing body's insulin level. The quantity of additives like Glycerine, Propylene glycol and Sorbitol reduces considerably. It is 1.2 times (approx.) sweeter than Sugar on equal brix basis. It is 1.7 times (approx.) sweeter than Liquid Glucose. (5, Source of Instant Energy. A Higher degree of Solubility than Sugar. Excellent Humectant hence Prevents Crystallization. Lower Microbial counts than sugar syrup. Lowers baking temperature for faster baking and enhances the aroma, improves texture and taste. Gives faster richer crust color and reduces breakage of biscuits. Tenderizes and helps retain moisture, ensures freshness and longer shelf life of bakery products. Reducing properties helps in inhibition of oxidative degradation in foods like jams, jellies, ketchup ice creams, fruit juices squashes etc. Imparts more luster and color, while retaining integrity and nutritional value of fruits. No crystallization when used in soft drinks, sherbets, and other cold recipes. The quantity of Milk powder in biscuit reduces considerably. Invert sugar enhances fruit flavors in products such as soft drinks, fruit baked goods, and fruit flavored confectionery. By including invert sugar, products are eaten straight from the freezer such as ice creams and sorbets can be made to be softer, and easier to scoop. Water white invert sugar is used in flavored vodka & gin.